"Best Dermatologist & Hair Transplant Surgeon." 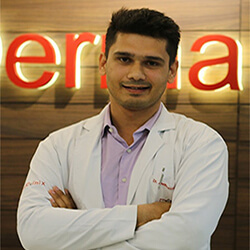 Dr. Vinay Kumar Nandal is a consultant dermatologist and hair transplant surgeon in DermaClinix, New Delhi. He has done his M.D. in Dermatology from Government Medical College, Surat and M.B.B.S from Pt. B.D.S. PGIMS Rohtak, Haryana. Doing megasessions and gigasessions with FUE method. Giving coverage in advanced grade of baldness. He is also one of the best skin specialists with a good hand in Chemical peeling, Acne surgeries, Skin grafting. M.D. Dermatology (2012-2015) Government Medical College, Surat. M.B.B.S. (2005-2011) Pt. Bhagwat Dayal Sharma PGIMS, Rohtak. A study of knowledge, attitude and practice towards leprosy patients in 1st year MBBS students of SMIMER and GMC Surat.